Brakes and steering – this reminds the driver that steering is not improved by braking. Brake before a corner while travelling in a straight line (or nearly so). If by misjudgment you need to brake again, do so with great discretion, otherwise the car will slide bodily. Steering and acceleration – this reminds the driver to place the car properly when starting from rest or accelerating carefully around a corner. These are the two controls used to make a car skid on a skid-pan. Accelerator and gear lever – drivers should use successively rising gear ratios with firm depression of the accelerator in order to increase speed promptly, and lower ratio(s) with a relaxed accelerator to… reduce speed. Gear lever and clutch – except for an occasional easing in heavy traffic, the clutch should only be used for moving off, changing gear and, in the last few yards, stopping. I find that linking controls encourages a smoother drive because it encourages flow, and flow depends on good timing… which needs accurate planning. Another link which I find useful is linking first gear with the nearside door mirror. When I engage first gear it is often because I intend to move off and, just before I do, it is usually appropriate to check all round starting with the nearside door mirror – the famous ‘three-mirror take-off’. The position of first gear is a physical reminder to look in that direction, towards the nearside mirror. It is also good to link dipped headlights with the use of windscreen wipers. Can you think of any others?? We have arranged a slow riding session on Sunday 30 April for group members, invited bike groups and friends. It will take place on the large car park at Bentley Motors, Pyms Lane, Crewe, starting at 10.00 am, and will last approximately 2 to 2½ hours. It will be interesting and fun, and will certainly test your slow riding skills. We have ample car park space, allowing for a number of practice courses, which will ensure maximum opportunity and time to practice and very little ‘waiting your turn’. The session will again be led by Gary Green: he’ll provide briefings and explanations on how to control and turn the bike at slow speed, demonstrate the techniques to ride courses like the slalom, figure of eight, and right-angle turns, etc, and then help everyone as you have a go yourself. Even if you’ve been before you can always brush up your skills, particularly if you’ve changed your bike. I enjoy watching Formula 1 (when it’s on a terrestrial channel! ), and one day would have liked to go to Silverstone to actually be there. Only the crowds put me off. So I was particularly grateful to my family for sending Robert (my son) and me to have a guided tour of the circuit. A two-hour tour starts in the Visitors’ Centre. Guests are divided into groups of about 10, taken to a minibus and driven around some of the areas that are difficult to reach on foot. The British Racing Drivers’ Clubhouse and library, and the impressive medical centre (a fully equipped hospital), were particularly memorable. Then we were driven to the corporate entertainment area, media centre, race control (fully equipped with television screens covering the whole circuit), commentary boxes, pit lane and garages. In the garages Robert and I were distracted by two shiny new cars. Neither of us recognised the model but the make is well known. As the guide was telling us about the garages, a security officer came to our group and told us to leave immediately. That particular garage was closed for secret testing of the cars Robert and and I were viewing: I can say no more! We stood in the pit lane outside Lewis Hamilton’s garage and studied the marks on the ground (some of which are not visible on television) that guide the driver and the mechanics to exactly where the car will be when it comes in for a tyre change. The mechanics train all year, with a particular emphasis on upper-body strength to operate the power tools quickly and accurately. They are athletes in their own right. Our guide had worked at Silverstone for many years. He was entertaining and informative. On race day, one of his jobs is to collect Bernie Ecclestone from the helipad and take him wherever he wishes to go. Finally, as an extra, we had a ride on the international circuit with a racing driver in an Aston Martin V8 Vantage. We enjoyed two laps on a greasy circuit where the driver enjoyed exploring the limit of grip as much as flat-out speed. A most enjoyable trip, which I recommend. Twelve bikes recently returned from a stunning trip to the Picos in Northern Spain, organised by Graham. Eight of us had our partners as pillion, so there were twenty of us in total, on a wide variety of machines. We all left home on Tuesday 27 September, with all but one of us arriving in Spain on the Santander ferry, as planned, the next day…. Exactly why one of us missed the ferry is another story involving a lost passport and a kind postwoman, but perhaps best ‘left on tour’. Brittany Ferries bill this 24-hour crossing from Portsmouth rather optimistically as a cruise. The Pont Aven is their current flagship, and is certainly a very big and upmarket ferry (at 184m long/2,400 passengers/250 cars). The infamous Bay of Biscay was kind to us and we had calm crossings in both directions, with plenty of time to get to know each other better in the bars and restaurants. We had booked a hotel near Potes, arriving there on Wednesday evening after a short 1½-hour ride from the port. Our instructions for Thursday were simple and very civilized – assemble in the hotel car park with full tanks and be ready to leave at 10 am. To get us in the mood, Graham took us on a ‘tyre and sump warmer’ up to the Mirador viewing point at over 1,500m altitude on the N-621 mountain pass. For Picos newbies like your correspondent, this was something of a shock, without doubt the most technically challenging road I had ever ridden. (‘Had,’ note: Graham soon found many more….) Not predictable like the more famous Italian passes where a left bend usually follows a right as you ascend, but sprinkled with blind corners, often tightening into 180º hairpins, no traffic but random cows higher up, all clearly well trained to leave their smelly deposits just out of sight around corners. Above the winter snow-line even the Spanish don’t maintain their road surfaces as well, so there was also some loose surface, but no UK-style potholes. Unfortunately, the pass was closed for repairs just before its highest point, blocking a key route out from Potes for us for the entire holiday and necessitating some major route re-planning by Graham. After stopping to admire the statue and views we set off for the Fuente De cable car where we had lunch at the 1800m high station, which has simply stunning views over the Picos. Then it was off to Covadonga through ‘The Gorge” and down ‘The Blue Railing Road’ (our names for these favourite sections of the AS-114). Because of the closed pass we got to know these roads very well. We have nothing like them in the UK. ‘The Gorge’, while not as extreme as the Mirador, is tight and technical, right up against a towering rock face on one side and a plummeting drop the other as it snakes its way down the side of the said gorge through amazing scenery a biker like me dares barely glance at. The Blue Railing Road, on the other hand, is fast and sweeping with long wide open bends that go on for ever (well, at least 15 km) with the alarming drop at its outer edge protected by – you guessed it – blue railings. Friday took us to Riaño for lunch. En route we used another pass, the Puerta de Piedrasluengas, and took in the views over the Liébana valley from its viewing point before stopping for coffee in Cervera de Pisuerga. This route also introduced us to ‘The Corkscrew’ (P-215), which needs no further explanation. Riaño itself sits on the shore of a massive artificial reservoir created in the 1980s by damming the Esla River to deliver hydroelectric power. The builders thoughtfully constructed excellent roads and bridges across the water, clearly just for bikers like us to enjoy. Certainly there were very few cars to get in our way. Because of the closed pass we were forced to use the Blue Railing Road and the Gorge to get home. Such a trial. Saturday took us on our longest ride so far, to the excellent lunch stop we had discovered in Riaño (thanks Den), but this time via Cangas where many of us had a rather long, unscheduled stop chatting to some natives (remember, what goes on tour, stays on tour). After lunch it was Puerto de Tarna on the CL635 and down the ‘bumpy road’ (we are nothing if not original, and Graham likes to find at least one track…) to Puebla de Lillo on the LE-333. On to Boñar for a fuel stop before a faster journey home using an unusually straight piece of road (for us), the CL-626. but we were on a roundabout from nowhere. In my mirrors I saw confused bikes going in all directions as we tried to navigate the new construction. Happily there was no drama and an orderly line continued over the mountain to home. After the long day on Saturday, we had a gentler and shorter sightseeing day on Sunday, via the Gorge and the Blue Railing Road (sigh) to the coast and Ribadesella. Here we spent two hours exploring the town, some of us enjoying a vintage car and truck display on the quayside before heading on the N-634 back to Cangas and on to the pink limestone Basilica at Covadonga where we spent an hour exploring the magnificent building and having coffee. Sadly, that was our last day: on Monday we started late and took the scenic route back to Santander and the ferry. We had ridden 1000 miles in 4 full days of riding on roads that we can only dream of in the UK; perfectly maintained, grippy tarmac with very little traffic, no rain and stunning scenery. Add in the great company and banter and there was a great holiday. Thanks for the company of Graham ‘O Great Leader’ Board; Scott ‘Fruit Fly’ and Virginia Walker; ‘Top Gun’ Den and Andrea; Martin ‘Stephen Spielberg’ and Gill Barrett; Steve ‘Memory Man’ Gibson; Paul ‘Daddy Bear’ and daughter ‘Goldilocks’ Rogerson; Paul ‘Scouser’ and Gerry Burke; ‘Pistol’ Pete and Lin Maxwell; ‘Saxy’ Andy Homoky (he wishes…); ‘Gentleman’ John and Zoe Homoky; and Gerry ‘Waltzer’ Dodd and Joan. We spend time learning pre-driving safety checks to make sure all is well before we set off on a journey. Other formulæ are more complicated, particularly if they were developed for use by the police (except the CID who, we are told, reduce the checks to ‘We’re in, we’re off!’). Roadcraft has suggested drills on pages 255-258, and includes personal checks for the driver to consider on page 254. It certainly helps to create a positive start to an observed drive, as well as serving as an important safety function, if you spend a moment running through some basic checks. I used to find on driving home from work that my seat and mirrors occasionally needed adjusting to compensate for my natural tendency to slouch. Then, the following morning, re-adjusting because I naturally sat up more. There seems to be less advice about what to do at the end of a journey. A drive, whether observed or not, is not concluded until the vehicle is parked, secured and the engine shut down. Often, the only reversing manœuvre on a drive is performed at the end, when the driver reverses into a parking bay. It is very tempting to allow the relief of completing the drive (and parking) to overwhelm us, and the final securing of the car, switching off auxiliary controls, checking dials, etc, before stopping the engine can be rushed or random. Watch a professional musician at the conclusion of their performance. They will have practised what they do with their hands and instrument, how they stand, bow and walk off the stage, so that these basic logistics complement the performance. It is important to spend a moment checking all is well before we leave the car, and taking pride in the standard of the whole drive. A BENTLEY F1RST FOR OUR GROUP! On Wednesday 22 June, our Group scored an IAM-wide ‘F1rst’ with a presentation by Bentley Motors of the marque’s history and the technology incorporated in modern luxury cars, together with an opportunity to view the Company’s new Bentayga SUV. So far, fewer than 200 Bentaygas have been manufactured, including the development models. Instructors Steve Moore and Tim Oakes from Bentley Driver Training brought one along for us, and gave us a lively and skilful two-man coordinated talk. The great English engineer W O Bentley founded his firm in 1919. His aim was to make ‘a fast car, a good car, the best in its class.’ He believed in racing, and Bentleys won at Le Mans in 1924, 1927, 1928, 1929 and 1930. Over the following decades, the Company had a very up-and-down history, but re-entered competition to win at Le Mans in 2003. Bentley Motors is now owned by the Volkswagen Group, forming part of VW’s Sports and Luxury Brand Group, which includes Porsche and Bugatti. From producing around 1,500 cars a year when it was bought by VW, Bentley now has 4,000 employees worldwide, operates in 58 countries, and is producing around 14,000 cars a year. The Bentayga has a six-litre twin-turbo W12 engine, built solely at Crewe. It produces around 530 bhp, yet in a steady motorway cruise, with one bank of six cylinders deactivated, can give up to 26 mpg. It is a practical vehicle: you can have it fitted with a towbar to take your luxury motor cruiser with you. Reversing with a trailer is no problem: the Trailer Assist facility uses a video screen and a knob on the dashboard to allow the driver to ‘point’ the trailer where he wants it to go, and the car will then steer itself accordingly. Two items caught my attention in a newspaper this morning. My reason for buying the paper was to read about Chris Evans resigning from Top Gear. I am a great Top Gear fan and have watched the new series with interest. I miss Clarkson and Co, but have enjoyed some of the episodes in this series. The format is still evolving and I look foreword to the next series. I would love to try the new off-road challenge in the rally car. But who should replace Chris Evans? VIcki Butler-Henderson or Tiff Needell in my opinion. The first story concerned a tractor driver who was prosecuted for obstructing traffic. 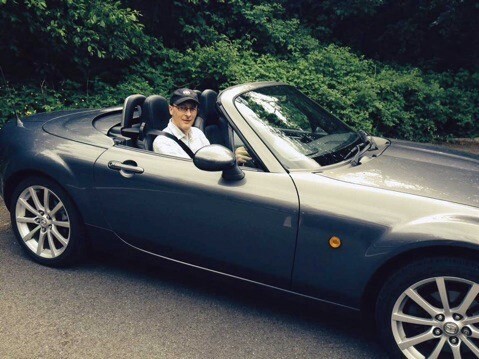 He caused a 50-car tailback when he drove for three miles at 25 mph. He claimed he could not see the tailback because a following lorry blocked his view. The 20-year-old farm worker, who was stopped near Glastonbury on the A39, was fined £190 and received three points for driving without reasonable consideration for other road users. The second story outlined proposals to replace T-junctions with mini-roundabouts, because stiff-necked elderly drivers find it difficult to look over their shoulders. Motorists over 75 are twice as likely to be killed at T-junctions than the average motorist. It is suggested that mini-roundabouts would be more pensioner-friendly. Greater use of segregated slip roads on motorways and some A roads. Wider white lines in the middle of the road. Extra traffic lights at crossroads. Larger lettering on road markings. The number of older motorists is expected to reach 8.5 million in 20 years’ time, up from 4.7 million today. There will be a million drivers over 85 years of age by 2025. Please note that dead badgers must always be reported to the Police Wildlife Crime Officers, phone 0845 458 000, or Crimestoppers 0800 555 111. The badger must be removed as soon as possible so that criminals cannot follow its path back to its sett and disturb other badgers that may be there. A dead badger can be sample tested to establish if it has been baited by dogs, killed and then dumped on the road to make it look as though it was a road casualty. The Protection of Badgers Act 1992 makes it an offence to kill, injure, ill-treat, dig for or disturb a badger, damage or destroy a sett, obstruct access to a sett or cause a dog to enter it. ‘Sorry mate, I didn’t see you!’ Even if you’ve got away with no or limited injuries, it’s an apology which isn’t appropriate as you survey the wreckage of your bike. Is this a driver being careless and dangerous or did he genuinely not see you? Andy Goodwin and I were discussing the importance of good observation, and that t he better your observation the better rider/driver you were. Andy, as you may remember from the June Newsletter, did some research and sent me a website link directing me to a report by John Sullivan of the RAF. According to his report, the answer may have important repercussions for the way we train drivers and how as motorcyclists and cyclists we stay safe on the roads. John Sullivan is a Royal Air Force pilot with over 4,000 flight hours in his career, and a keen cyclist. He is a crash investigator and has contributed to multiple reports. Fighter pilots have to cope with speeds of over 1,000 mph. Any crashes are closely analysed to extract lessons that can be of use. John asserts our eyes were not designed for driving. We are the result of hundreds of thousands of years of evolution. Our eyes, and the way that our brain processes the images that they receive, are very well suited to creeping up on unsuspecting antelopes and spotting threats such as sabre-toothed tigers. These threats are largely gone and they’ve been replaced by vehicles travelling towards us at high speeds. This, we’ve not yet adapted to deal with. Why? Light enters our eyes and falls upon the retina. It is then converted into electrical impulses that the brain perceives as images. Only a small part of your retina, the centre bit called the fovea, can generate a high-resolution image. This is why we need to look directly at something, to see detail. Stand 10 metres away from a car. Without moving where your eyes are now looking, try and read the number plate of the car. The test shows you quite how little detail you are able to truly capture from the side of your eyes. That’s not to say that we cannot see something in our peripheral vision – of course we can. As you approach a roundabout, you would be hard pressed not to see a huge lorry bearing down upon you, even out of the corner of your eye – obviously, the bigger the object, the more likely we are to see it. But would you see a motorbike, or a cyclist? The report is extensive, and at six pages is too long for the blog, but I’d urge you all to click the link (or type it into your browser) to read the rest of it. It makes for very interesting reading, and there’s another test for you to try as well as advice and guidance in how driver/rider and cycle training should be structured. The report is at http://www.londoncyclist.co.uk/raf-pilot-teach-cyclists/. 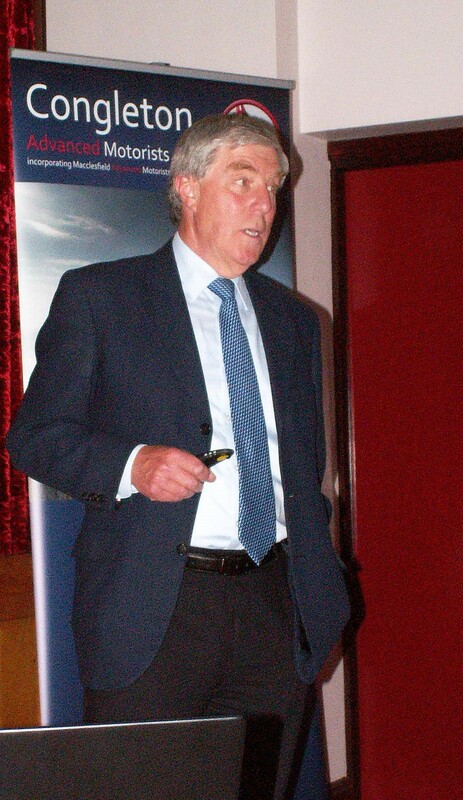 On Wednesday 25 May, Group member and observer Victor Crawford gave us an update on the work of the North West Air Ambulance charity (NWAA). Victor is an enthusiastic and very committed Volunteer Presenter for NWAA, and his talk was partly based on NWAA’s ‘official’ presentation, and partly on his own research. Rapid pre-hospital care: preparing the patient for hospital treatment. Emergency medical treatment. Time is often of the essence in enabling a patient to make a good recovery: as well as talking of the ‘golden hour’ in which to get a person to hospital, people now speak of the ‘diamond 10 minutes’ to provide initial treatment. This can be achieved by the helicopter bringing a doctor to the patient, rather than waiting for the patient to reach the doctor in a hospital. In the USA, some air ambulance units now carry an air-transportable operating theatre. Each NWAA helicopter now carries a pilot, a paramedic who is also the navigator, and a specialist doctor. The County Air Ambulance Trust, a separate charity from the regional air ambulances, aims to instal a helipad at every hospital in England, to help provide the fastest possible treatment for emergency patients. NWAA is one of 18 air ambulance charities in the UK. It is entirely funded by sponsors and charitable giving – like the RNLI, it receives no Government funding. It operates three helicopters, which are leased, with their pilots, from Bond Air Services, at £6m a year. Leasing has substantial advantages over purchasing the helicopters: if a leased helicopter goes unserviceable, the lessor, Bond, provides a replacement straight away, instead of the charity having to wait for its own machine to be repaired; likewise, pilot training and checking is dealt with by the lessor, rather than the charity having to provide its own supervisory staff. One helicopter is based at Barton, and two at Blackpool. NWAA’s ‘parish’ covers the area from Cheshire to south Lakeland, a region of 5,500 square miles, with eight million people, and terrain and infrastructure ranging from cities and motorways to agricultural land and wild countryside. The latter bring out the advantages of air ambulances over land vehicles: land ambulances are often unable to get quickly to the scene of an emergency on agricultural land or in the wild, especially in wet weather, when even if there is access they may get bogged down. (Road ambulances are now very heavy, because of all the equipment they carry.) Moreover, even if an emergency scene is nominally accessible by road, when traffic congestion holds up surface vehicles a helicopter can jump the queue, and so achieve the critical aim of helping a patient rapidly. NWAA flies 2,300 missions a year, and the number is increasing. At present they operate in daylight hours only. About one-third of their calls are to road accidents, and about a quarter of these involve motorcyclists. They will normally fly a patient to the hospital providing the most appropriate specialist care, rather than necessarily the nearest one. Wythenshawe Hospital, for example, is a national centre of excellence for treating burns. Victor showed us some of the places where NWAA helicopters have landed – on a mini-roundabout, with hazardous street furniture all around, or on a motorway, only after both carriageways have been closed to traffic, to avoid opposite traffic having accidents through drivers looking at the helicopter. If you dial 999, the ambulance controller will first want to know where you are. If you don’t know, and are using a mobile phone, they will ask permission to locate your mobile. Their objective is to get a land ambulance to you in nine minutes in a severe (‘red’) emergency, or in 20 minutes for a less urgent (‘amber’) situation. For a non-critical (‘green’) situation, they will aim to get a doctor to ring you within 60 minutes. The nine-minute objective for severe emergencies is achieved in 75% of cases. Altogether, Victor gave us an excellent update on NWAA’s work, and the Group will be making a donation to NWAA as an expression of support and our appreciation. Yes. I’ve done another driving course. This time I was at the Thruxton circuit near Andover in Hampshire. I had booked a session on the new (2014) skid pan. My first skid pan course was at Thruxton in 1985 on the traditional oil-covered surface, and I went there several times after that. That skid pan closed many years ago, so I was interested to see what the new facilities were like. 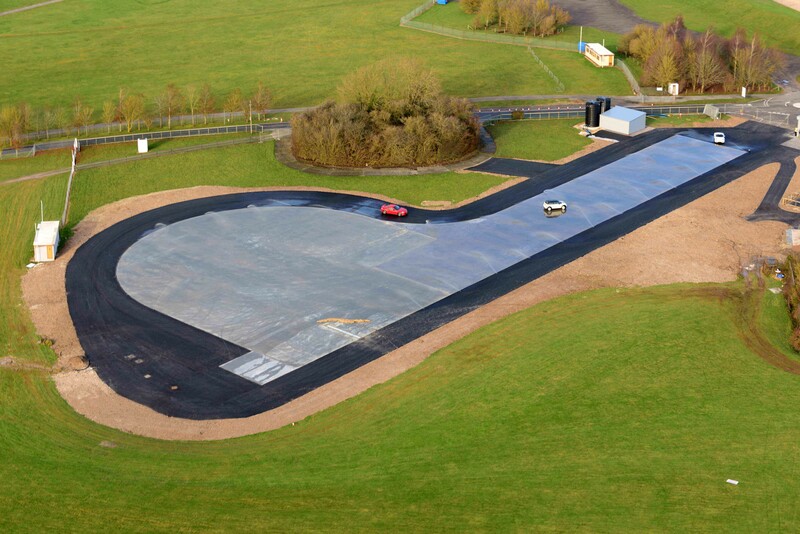 The new skid pan comprises 3,200 square metres of polished tarmac lubricated by clean water. The vehicles are a Toyota GT 86 with rear-wheel drive (RWD) and a Mini Cooper with front-wheel drive. Both vehicles can have traction control and ABS on or off. The Mini was by far the harder of the two cars to control. The instructor was clear that RWD is preferable in difficult conditions. We were taught in a front-wheel skid to lift off the gas and counter-steer the exact amount you were trying to steer in the first place. So if you were steering 30 degrees to the right and getting no response, lift off and steer 30 degrees to the left. But not for too long. For rear-wheel skids as well as steering into the skid we were advised to use a little accelerator as the car corrects, being very careful not to overdo it or the car would snap into a secondary skid. I have to say that everywhere I go on skid courses, at racing circuits and with the police, the instruction and advice is different and often contradictory. This is compounded by continual developments in vehicle engineering. With ESP fitted to my own car I should not unsteer an understeering skid because the electronics will recognize the discrepancy between the steering angle and the actual angle of travel and make the necessary corrections. Unsteering defeats the object of the ESP. When I mentioned this to the instructor he told me that if ESP fails I would need to know what to do. Fair enough: but by the time I’ve figured out that ESP is not working as I’m skidding along the road I will have crashed! While at Thruxton I took advantage of the opportunity to have a high-speed lap as a passenger in a Skoda Octavia vRS (2 litre, 220bhp, 154mph, 0 – 60 in 6.8 seconds). My driver was a ‘tame racing driver’. I’ve been driven round Thruxton quickly many times but this was unbelievably fast and occasionally sideways! Great fun. Great driver. Great car.